We recently blogged about our new standing page which brings together sources of guidance on publishing for editors. But we know that sometimes you need more bespoke advice about content. 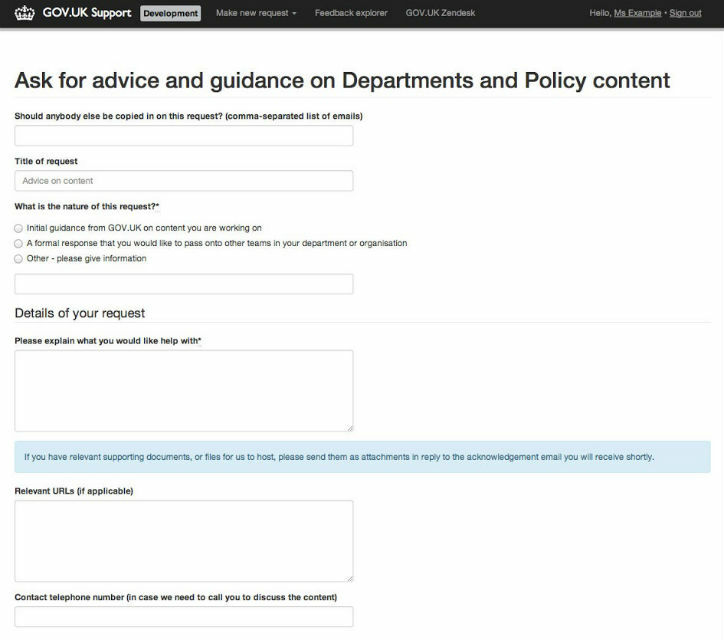 So we’re adding a new Zendesk request form specifically for you to ask for advice and guidance on Departments and Policy content. This could be advice about formats, style, structuring content, writing in plain English or checking if the content fits the GOV.UK proposition. It could be a quick question about content you’re working on or the need for a formal response you can share with colleagues in your organisation. Whatever the nature of your request we need you to clearly explain what it’s about and what your deadline is. This will help us prioritise the work in our next sprint and know how much detail we need to give in our response. We hope this will be particularly useful if you're the sole web editor in your organisation, or if you need an impartial opinion when you're discussing content with colleagues. You should carry on using the usual Zendesk form to raise tickets about all other requests. This is a really helpful development - thank you. Thanks for this. It should be really helpful. What timescales do you envisage for replies to these requests? The blog post suggests you'll look at them in the sprint after we send them. Sometimes we may be under pressure to publish something urgently that we do not think is appropriate. Is there a way to get quick responses in situations like this?